I've been told in one form or another: "no colour, no flavour", so when cooking Spaghetti Bolognese I always brown the meat (after chucking in the onions, carrots, celery etc.). The browning does impart flavour but it also alters the texture of the minced meat - it becomes grainier, drier, etc. It's not that i'm overcooking it, I believe this to be a natural byproduct of the browning – the browning can only occur once the moisture has been cooked off, after which point the meat forms a crust and becomes harder. 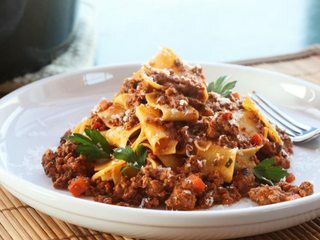 Is it possible to retain the flavour benefits of browning alongside the qualities of the mince being tender and moist? And now we get to the most crucial phase of the process: the long cook. If you take a quick look back at that passage from Cook's Illustrated, they do make one good point: browning meat toughens it far more than simply simmering it. But we also know that browning adds flavor, right? 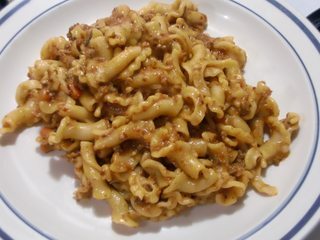 In fact, some very well-respected ragù recipes call for browning the ground meats until very brown, like the version that Mario Batali makes on The Chew. In that version, he cooks the meat until what he calls "beyond brown". I've made that recipe (or variations close to it) a number of times and have even eaten what can be presumed to be the same sauce at two of his restaurants. It's absolutely packed with flavor, but I simply can't get over the dried nubs of meat you end up with when you brown ground meat past the last inch of its life. Surely there has to be a way to get great browned flavor without having to reduce the tender meat to dry rubble? In point of fact, the whole reason I was extra excited for Bolognese season to start this year was because of this slow-cooked tomato sauce technique I developed a few months back. The concept is simple: rather than simmering a pot of tomato sauce in a pot on the stovetop, just transfer the whole thing to the oven. Not only does the oven deliver more even heat and better reduction with less mess, but it also creates delicious caramelized bits of tomato on the top surface of the sauce and around the edges of the pot which you can stir back into the finished sauce for richer, deeper, more complex flavor. Doesn't that look good? He gets down and dirty with all of the explanation of his technique in the article linked to in the beginning of this answer. EDIT HA! I made it (with half the liver), and it turned out great! When I make Bolognese I take the mince carefully from the packet in its cuboid shape and place it straight onto a smoking cast iron and then flip it after a few short minutes, like a rare steak. The ratio of caramelised to pink meat it the same as in a good steak. When it comes to the liquid cooking stage, the cuboid can be broken up to give a good mix between Maillard-y goodness and succulent, untainted meat. For me, separating the strands of mince first just causes the strands to boil in their own juices (and, let's face it, the injected water which pours out). Because they are so thin, they cook straight through before any colour is achieved. When I brown mince I start with the mince alone, get it nice and brown till all the fat is released. Then I pour off the majority of the fat, I can only afford the cheap stuff so there is a lot possibly a cup full. Then I throw my onions and garlic in till tender, then add the rest. By the sounds of it, what you are doing is essentially boiling your mince first is all the water coming from your veg and meat. Till breaks down the mince to a horrible grainy texture, then you are Browning the grains. Also when adding the tomatoes you need to pretend you are making a soup, low and slow. Boiling too rapidly will again effect the texture of your mince. Don't add salt until near the end. Adding it at the start draws more moisture from the meat before the Browning can start. Adding it before you've reduced the tomatoes can risk an overly salty sauce at the end, due to higher concentration. I think if you keep those 3 points in your mind next time, you won't find it so dry and grainy. Classically speaking the meat should be browned in batches so it doesn't stew. You don't want all those juices to run out of the meat. That is how you end up with dry meat in the end product. The simplest way is to use higher heat. Put the meat alone on high heat, and stir it now and then until ready. If you want to cook the vegetables for a very long time, it might make sense to wait until the last 15 minutes or so before adding the meat. If you are not cooking the sauce in the same pan as the one in which you browned the meat, it makes sense to deglaze and add the liquid to the sauce. Also, I wouldn't throw out the fat, that's where the taste is. But most people's preferences differ on that point. I always brown the minced meat first, with chopped onions, olive oil, oregano, basil, chopped parsley and grounded pepper.. I let that simmer until there the entire meat is brown (as kids we used to eat some of that right away).. Then I add carrot stripes and cinnamon sticks.. Adding sieved tomatoes, I let the bolognese simmer for about 1 and a half to 2 hours.. The longer the better, just like making soup..
Not the answer you're looking for? Browse other questions tagged meat flavor temperature italian-cuisine or ask your own question. Coating meat in flour before browning, bad idea?